The Delhi High Court has refused to lift its stay on the nursery admission process. 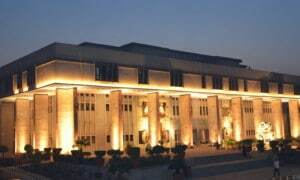 After hearing the various stakeholders, the division bench consisting of acting Chief Justice BD Ahmed and Justice S Mridul, extended its interim stay till April 2, 2014. The court also directed the Directorate of Education to ensure the rights of children who could have secured admission in the inter-state transfer category but are facing uncertainty due to its dismissal. It also asked the DoE to update its website with details related to the earlier draw of admissions conducted. Earlier, the HC had rejected the data provided by DoE related to nursery admissions in unaided recognised private schools. According to the guidelines, out of 100, 70 points are given to kids who reside within 8 km radius of a school. Twenty points are given to children whose sibling is studying in the same school and five points for children of alumni.